More suede? Somebody stop me! I'm going to have a wardrobe made entirely of suede at this rate, if I'm not careful. But when I started to see suede trench coats popping up in stores I just fell in love. I reasoned that I needed a smart and fairly lightweight coat for Autumn, and I've been wanting to get a decent trench coat for ages, so I decided to snap up this Missguided coat before everyone else beat me to it. And I'm glad I did! 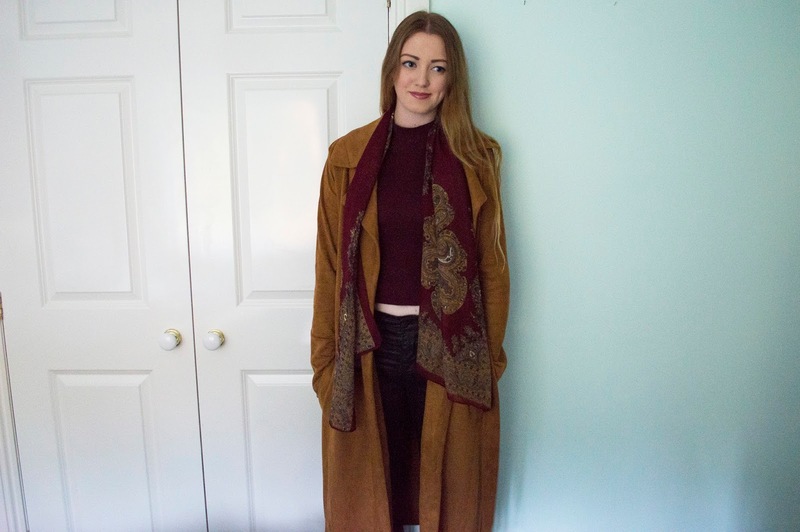 It's probably the best value for money suede trench I've seen - though a few places (ahem, Primark) had cheaper versions, I wanted to get one that was of a reasonable quality and wouldn't disintegrate at the slightest drop of rain. 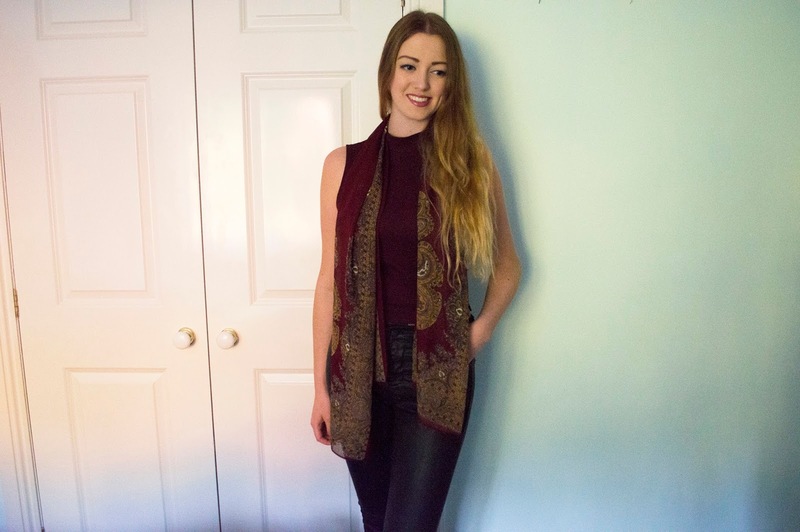 I've mentioned before how much I love wine red for autumn (in this post), so picking out this sleeveless polo neck top for this outfit was a no-brainer. I was also delighted to find that the scarf pulled the outfit together nicely - it's something I picked up while staying in Cavtat last week, and I love its vintage-inspired print. It was gorgeous weather when I wore this yesterday, one of those sunny autumnal days where the leftover warmth from summer drives away any nip in the air. I'm glad it seems to be staying like this for at least a few more days, as I'm not quite ready to bundle myself up in too many layers yet! Here's hoping to a long autumn and a short winter. that wine red colour is so gorgeous, definitely my favourite colour for autumn/winter. 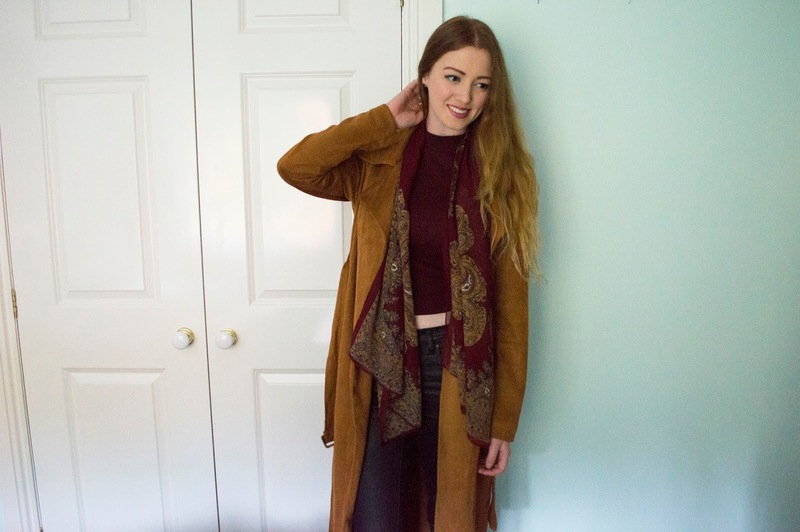 I've become a bit obsessed with suede too, it's just such a lovely texture! Gorgeous! Love the tones of orange and red! This coat is lovely! I want suede EVERYTHING. Gorgoeus outfit, love the coat! Gorgeous! I love the coat! 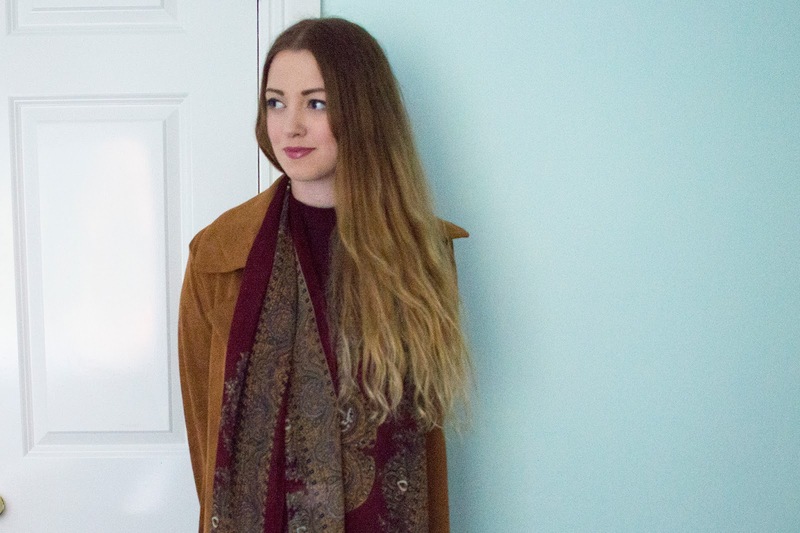 I love suede (: such a great outfit you created! You look great and you have very nice hair haha. Im definitely here wishing for a long autumn too! Gorge scarf! Suede is such a classy material, only thing is it requires a lot of care. But no pain no gain right? :) Love the autumnal colours, especially the burgundy!